Everyone knows the scene. On a stormy Transylvanian night lit by a full moon and serenaded by the howling of a wolf, a mysterious coach pulls up to a dilapidated castle. Timidly, the coach’s passenger makes his way to the castle door. As the door slowly creaks open, we finally see the lord of the manor—a formally dressed nobleman with regal bearing—a creepy and ironic image of a proper European aristocrat. At which point, Count Dracula bids us welcome. Dracula is not like other traditional monsters. His elegance and sophistication set him apart. Much like a Bond villain, Dracula could almost pass as a head of state or a captain of industry. The horror comes from our knowledge that underneath that polished exterior lurks a creature ripped out of nightmares and campfire stories. And that contrast between the outer and inner character provides the complexity that separates not only Dracula, but most modern vampires from all those more interchangeable creatures that go bump in the night. Such was not always the case. The vampires of folklore were a far cry from Bela Lugosi, Christopher Lee, Gary Oldman, or even Tom Cruise. They were more zombie than Victorian gentleman—blood sucking parasites risen from the grave to haunt many a Middle Eastern or European village. The modern vampire was born, not in the pages of Bram Stoker’s Dracula (1897), but rather in a story that was written over 75 years earlier. The first modern vampire’s name was Lord Ruthven, and like his fraternal twin—Frankenstein’s creature—he originated in Geneva, Switzerland during the summer of 1816. As many readers may already know, that summer featured the first meeting of two of the most celebrated and controversial English poets—Percy Shelley and Lord Byron. Shelley was travelling with his soon-to-be wife, Mary Godwin, and her step-sister, Claire Clairmont. 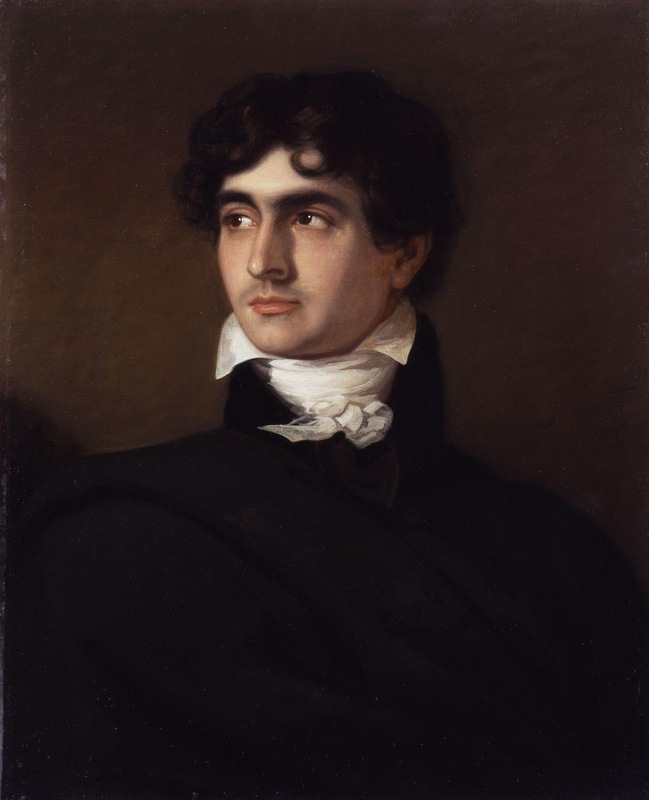 Byron was traveling with his newly-hired personal physician, the young John Polidori. As the story goes, they challenged each other to see who could create the best ghost story. Ironically, the two stories that have had the most impact didn’t come directly from the famous poets, but rather from Mary, who completed Frankenstein in 1818, and Polidori, who published a novella, The Vampyre, in 1819. But The Vampyre didn’t actually begin with Polidori. The central conceit of the story originally came from Byron. Later published as “Fragment of a Novel,” Byron’s story is told by an impressionable young man who is fascinated by an older man named Augustus Darvell. The young narrator can’t quite figure out the older Darvell, a “man of considerable fortune and ancient family,” but Byron’s readers would’ve most likely recognized Darvell as a colorful, enigmatic reflection of Byron himself—or at least of his popular persona. 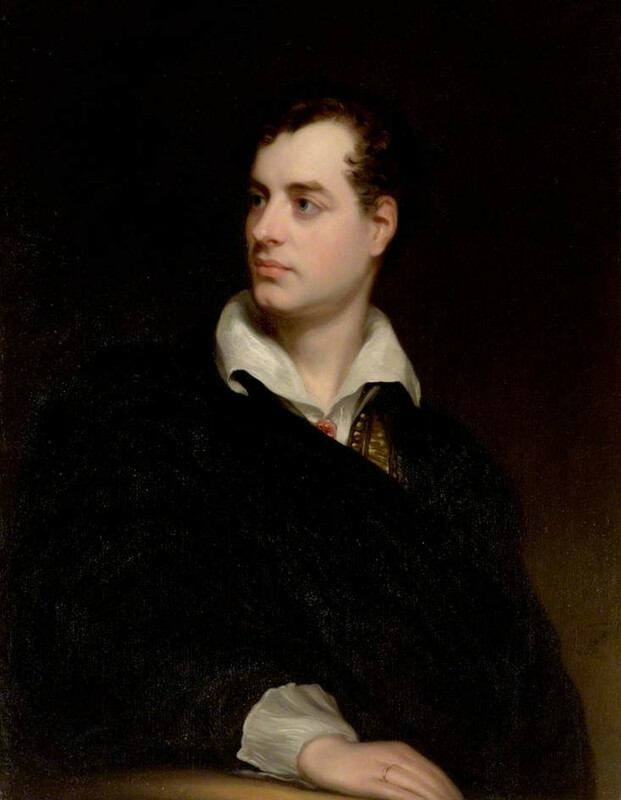 Through a series of affairs, Byron had become the most controversial literary figure in England—“Mad, bad, and dangerous to know” as Lady Caroline Lamb, one of his lovers, famously put it. In fact, as he journeyed to Switzerland in 1816, he had been permanently exiled from England. Like the early 19th century equivalent of a rock star, Byron was the Romantic era’s most notorious “bad boy,” and he made news wherever he went. In the story fragment, the mysterious Darvell garners similar attention—particularly from the narrator—but Darvell gradually grows pale and weak. Warning the young narrator to tell no one, Darvell prepares for his death, providing precise instructions for his burial and directing the young man to throw a ring into the Bay of Eleusis on the 9th of the month and then to go to the temple of Ceres on the following day with the implication that something … interesting would happen. Well, it’s not called a fragment for nothing. That was as far as Byron got. The fragment reads mostly like a teaser, really, although Byron does lay the groundwork for something particularly dark early on when the narrator notes, “Where there is mystery, it is generally supposed that there must also be evil.” The young man says he hasn’t found such evil in Darvell yet, but the line seems a clear indication of where the story would eventually go. The fragment would most likely have never seen publication had Polidori not reworked the same scenario in writing The Vampyre. Byron and Polidori hadn’t really got along and the young doctor was soon fired after the summer of 1816. When Polidori expanded upon the basic elements of Byron’s story fragment—younger man obsessed with mysterious older man, death of the older man, sworn oath to keep the death a secret—the young doctor managed to ride on Byron’s coattails while simultaneously enacting a bit of literary revenge. And along the way, both he and Byron managed to transform a crude village folk monster into the Romantic, aristocratic, modern vampire. In expanding the story, Polidori strikes an uneasy balance between Gothic horror and a portrait of his time spent with Byron. These two threads are evident in the supplemental material he uses to pad the beginning of the tale. The first is an excerpt of a letter that explores his time with Byron in Geneva as well as with Percy Shelley, Mary, and Claire. He then follows up this literary context with an introductory essay on the history of vampire folklore in the Middle East, Greece, and Europe. Then, before beginning the tale, Polidori attempts to interweave the two threads by including part of a poem by Byron that alludes to vampirism. Conflating the reputation of England’s most notorious celebrity poet with the concept of a vampire certainly held promise—as Byron himself seemed to recognize—but the shifts in mood in Polidori’s story often cause it to lose its grip on the reader. As the tale begins, Polidori introduces us to a young man, Aubrey, who is fascinated with a mysterious nobleman who has caused a stir in London society. Lord Ruthven, it seems, had become a focal point for bored socialites, in part because no one seemed fully able to understand him. He was joyless and spurned the advances of some of society’s more provocative women. However, he seemed to cultivate relationships with the most virtuous women of the city, drawing them in and then leading them astray. After Lord Ruthven surprisingly asks to accompany Aubrey on his grand tour of Europe, the younger man notes how Ruthven manages to find and embrace vice at every stop, hanging out in gambling halls and corrupting young men and women—seemingly as sport. The Vampyre is top heavy with this kind of material, which seemingly fits more properly in a comedy of manners than in a Gothic horror tale. It’s almost like Pride and Prejudice had Jane Austen focused more on the exploits of Wickham than of Elizabeth and Darcy. Lord Ruthven, as the stand-in for Byron, is a glamorous and compelling object of attention, but he is ultimately viewed as a corrupter—someone who needs these virtuous people around him in order to satisfy some unholy urge to destroy. And by the story’s end, Lord Ruthven manages to destroy most everyone with whom he comes into contact. Polidori does attempt to keep the horrific elements on the menu, but he doesn’t seem all that comfortable integrating them into his story. The most violent and disturbing descriptions come, not from the tale, but rather from his introduction where he details a particular case of an alleged vampire that was staked, decapitated, and burned. Polidori is clearly more comfortable with the Byron-as-vampire metaphor than with frightening his readers. Once Lord Ruthven “dies” and forces Aubrey to swear that he will keep his death a secret, the story seems to jump haphazardly to its conclusion. Put more bluntly, once Polidori runs out of elements from Byron’s story fragment, it seems he can’t end the tale quickly enough. There are a few thrills—Aubrey’s fight in the dark with an unseen and unrecognized Lord Ruthven provides the most suspenseful moment, and Polidori’s periodic attempts to connect Lord Ruthven’s behavior with the supernatural add to the sense of dread. 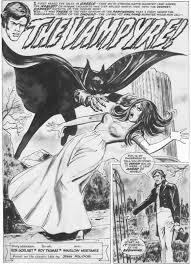 But The Vampyre’s lasting impact is the reimagining of the vampire of European folklore into an icon of Romanticism. No longer a mindless parasite from the grave, the modern vampire emerges in this story as a formidable creature of horror and myth—elegant, enigmatic, and Romantic. Since then, most of the vampires of popular culture—Varney, Carmilla, Dracula, Barnabas Collins, Kurt Barlow, Lestat, Spike, Angel, and even, I guess, Edward Cullen, owe a debt to Lord Ruthven as well his birth parent, Lord Byron, and his adoptive parent, Dr. John Polidori. Greg Carpenter is the author of The British Invasion: Alan Moore, Neil Gaiman, Grant Morrison and theInvention of the Modern Comic Book Writer. His writing has appeared on Sequart.org, RogerEbert.com, and PopMatters. He also has a Ph.D. in English, but he kindly asks that you not hold that against him. He currently teaches university courses in Comics, Shakespeare, and both American and World Literature.